After trying many complicated and uninspiring ideas and designs, I finally—-a month and a half before the wedding—-decided to see if I could buy Lord of the Rings fabric online somewhere. Yes! You really can buy Lord of the Rings fabric! The piece below is one designer’s interpretation of the Eye of Sauron. I bought several pieces of fabric and then pieced together a fairly simple quilt top with a more complicated design in each corner. I decided to do the actual quilting myself, and even though I didn’t pick complicated designs, with a quilt this large on my regular domestic sewing machine, I still spent far more time quilting the quilt than piecing it together. 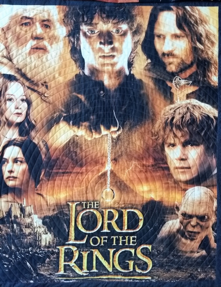 The stunning Lord of the Rings fabric panel on the front of the quilt is an actual reproduction, on fabric, of the movie poster from the first movie, The Fellowship of the Ring. You can buy this on Amazon and a great website called Spoonflower.com. (The links for this and other fabric used in the quilt are at the end of the blog.) Please note that pre-printed panels like this one are not necessarily printed exactly straight or cut very precisely. If you use pre-printed fabric, be prepared to trim the panel and maybe adjust the measurements of the rest of the quilt. 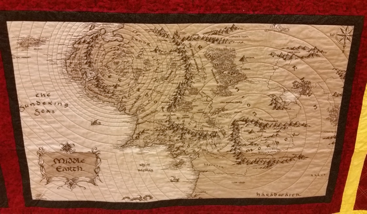 I decided to quilt this panel, starting at the One Ring, in a spiral with lines one inch apart. I quilted this with my walking foot, and once you get the spiral started, this quilting design is not too difficult to sew. Starting the spiral at the One Ring visually demonstrates how central it is to the books and movies, and I had several people comment that the spiral emphasizes the One Ring’s ever-increasing influence on everything pictured in the panel. My nephew and his fiancé wanted quotations from J.R.R. Tolkien on the quilt. Luckily, my daughter is very willing to embroider for me. The first quotation comes from The Hobbit and is spoken by Gandalf about Bilbo. I spent the most time quilting the large borders around the central square of the quilt. 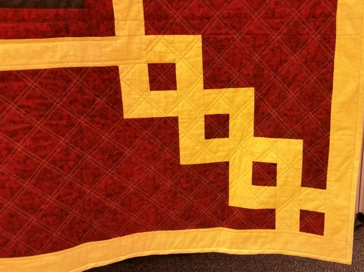 Using some of the ideas in Explore Walking Foot Quilting by Leah Day, I quilted the border with bright yellow thread in a pinstripe grid set on point. The lines of stitching in the “pinstripe” are about ¼” apart, and the distance between one set of pinstripes to another is about 2”. “On point” means that the squares in the grid are sitting on their points and not their sides. 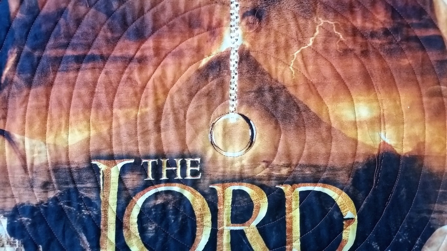 For the back of the quilt, I found a matching fabric that I sewed to all of the extra Lord of the Rings fabric that I didn’t use in the quilt top. 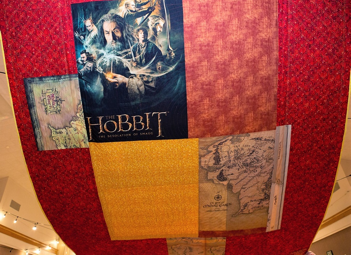 This includes a fabric panel of The Hobbit movie poster, Lothlorien trees, and random pieces from maps of Middle Earth. (Yes, I could have saved them for another project, but I wasn’t quite sure what that would be.) I pieced them together randomly, which you can see from the photo. With the colors of the fabrics (picked by the bride and groom), the printed fabric panels, and the extensive quilting, the quilt looks stunning! 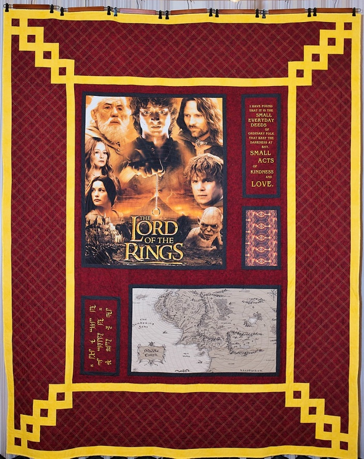 Even if you never sew a Lord of the Rings quilt, I hope this post gives you some ideas of how you might make a quilt about a specific subject. If you search on Amazon and Spoonflower, you will find fabric that relates to not only The Lord of the Rings, but also The Hobbit, Harry Potter, Star Wars, Marvel Comics, and probably just about anything else you might want. 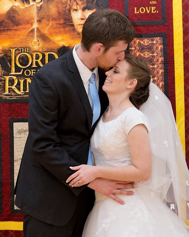 Amazon has a surprisingly large collection of Lord of the Rings fabric. Spoonflower.com has beautiful fabrics from many different designers. For maps of Middle Earth, click here. 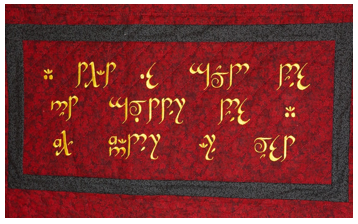 For machine embroidery designs in the Tengwar Elvish dialect (you didn’t know there were different versions of Elvish, did you? ), visit Lynellen’s Etsy shop. You can find Leah Day’s book, Explore Walking Foot Quilting, at her website, leahday.com. I purchased the print edition. You’re welcome!I’m glad you liked the quilt, and I was very happy to find this fabric online. This quilt is way cool…Lucky niece. So cool. I love the quote, which is so true. Thanks! 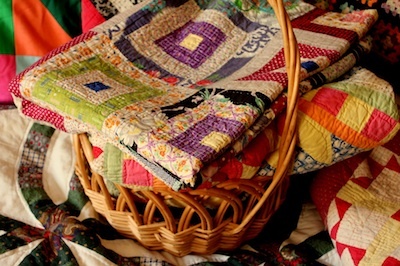 It’s been a popular quilt with people who love the books and movies. Holy cow, Allison! This is absolutely amazing! Thanks for sharing so much detail about the process of designing and quilting this incredible piece. Do you think Jenn can find a way to work it into an upcoming Amish romance novel? Ha ha! I have no idea. I’m glad you liked it.